Forging pattern (kitae hada) : Kitae-hada is conspicuous Ō-Itame-hada mixing with outstanding Masame-hada that appears mostly on both boundary line of cutting edge and back ridge. The surface is covered in sparkling Ji-Nie of martensite crystals over the surface that generates Chikei of darkish Nie lines. Tempering pattern (hamon) : Quenching area is covered with rather on profuse coarse side of Nie. Flamboyant pattern of undulating Ō-midare - mixture of Gunome zigzag, Clove or pointed tip outline with complex various patterns. The quench splashes over Hiraji surface and overflows along the back ridge to form "Muneyaki" generating "Hitatsura". In the interior of temper, there works with ASHI, YOU activities and thick KINSEN ( long lines of Nie / bright curved threadlike areas). The entire quenching pattern is full of Nie activities, vividly bright and the interior is filled with deep mist granules of Nioi. Temper of tip (boshi) : Temper of tip is rather on stronger Nie side, forms irregular pattern harshly with "Hakikake" brush up indication then turns back deeply that connects to Muneyaki. Tang (Nakago) : Fish belly (Tanago-bara) shape Nakago is UBU, unaltered. "Katte-sagari" shallow slanting left file marks, there is a little mass on the back ridge. Single-bevelled (Ha- agariKurijiri) heel shape. Two retaining holes of "Mekugiana". There is clear chiselled two character inscription to read HIROTSUGU 廣次. The power of Sōshu school in Sagami province ever since Kamakura era had been declining down to Muromachi period due to the reasons that Sōshu technique was the most troublesome technical method among 5 major schools. HIROTSUGU 廣次 observed the real tradition of main Sōshu technique. From the reference of Nihonto-Meikan, founder HIROTSUGU 廣次 who belonged to the HIROMITSU 廣光 family appeared in Eitoku-era 永徳(1381-) and the identified 2nd generation was active during Kakitsu era 嘉吉(1441-). The most of substantial extant works were made by the 3rd generations of HIROTSUGU 廣次 in Meiou era 明応(1492-). 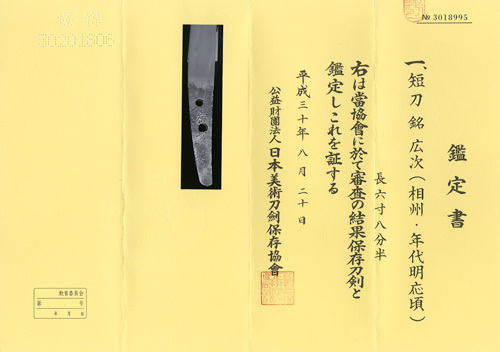 The subject stirring Tanto is judged as the work by the 3rd generation of HIROTSUGU 廣次, family name Ichikawa 市川,given name Choubei 長兵衛. Almost no-curvature, thick is Kanase was designed for stabbing rather than cut through the openings of armor or helmet, Itame forging of functional mixture with hard and soft steel was designed for the possible best durability. "Hitatsura" quenching technique was carefully designed for the most supreme sharp performance and "Muneyaki" was designed for defending against hard hitting. The Nakago shape - Fish belly (Tanago-bara) by HIROTSUGU 廣次, legitimate Sōshu-tradition like this example had a strong effect on the other school of Shitahara school in Bushu, Shimada school in Suruga and Senko school in Ise. 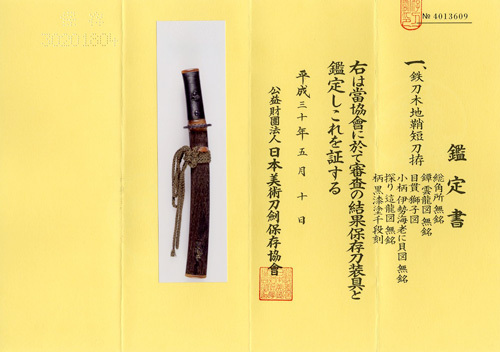 This prominent Tanto has been treasured by powerful legitimate Samurais in generations over the passage of 500 years or more. preserved in a Shira-saya plain wood mounting.